The Z-Bar floor lamp in silver finish, by Koncept. Z-Bar Floor is an ultra-thin and flexible floor lamp that fits any room or décor. Need ambient light? Turn the LED head to the ceiling. Need reading light? Pull the LED head down to sofa or chair level. Need no light at all? Fold the LED head against the body and you have a slim, sculptural piece. The super-adjustable LED head can spin in its socket, sweep side to side, and rotate around the end of the arm to point in any direction. 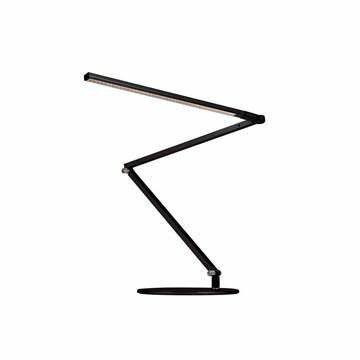 The Z-Bar floor lamp in black finish, by Koncept. Z-Bar Floor is an ultra-thin and flexible floor lamp that fits any room or décor. Need ambient light? Turn the LED head to the ceiling. Need reading light? Pull the LED head down to sofa or chair level. Need no light at all? 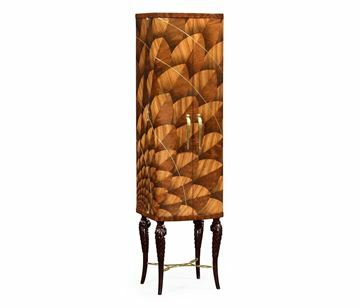 Fold the LED head against the body and you have a slim, sculptural piece. The super-adjustable LED head can spin in its socket, sweep side to side, and rotate around the end of the arm to point in any direction. 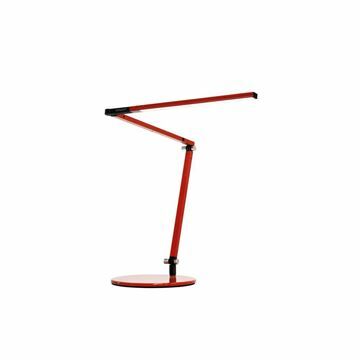 The Z-Bar Mini desk lamp in red finish, by Koncept. The Z-Bar Mini packs all of the style and features of its big brothers. This smaller version definitely delivers the same classic design, long reach and flexibility and multi-directional LED head. The only difference is, this Mini fits in a smaller space. Minimalism at its best. No bulky bulbs - just a slim row of tiny LEDs you can turn to illuminate any direction. Mini is a compact Z-Bar model that contains all of the great functionality of the classic Z-Bar. Features the award-winning three-bar design. The super-adjustable LED head can spin in its socket, sweep side to side, and rotate around the end of the arm to point in any direction. 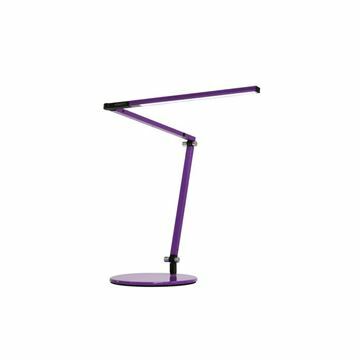 The Z-Bar Mini desk lamp in purple finish, by Koncept. The Z-Bar Mini packs all of the style and features of its big brothers. This smaller version definitely delivers the same classic design, long reach and flexibility and multi-directional LED head. The only difference is, this Mini fits in a smaller space. Minimalism at its best. No bulky bulbs - just a slim row of tiny LEDs you can turn to illuminate any direction. Mini is a compact Z-Bar model that contains all of the great functionality of the classic Z-Bar. Features the award-winning three-bar design. The super-adjustable LED head can spin in its socket, sweep side to side, and rotate around the end of the arm to point in any direction. 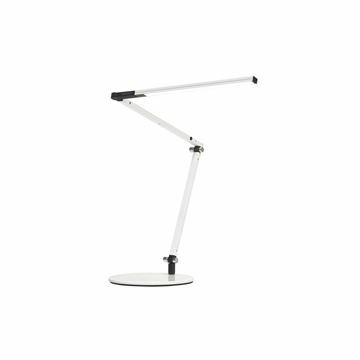 The Z-Bar Mini desk lamp in white finish, by Koncept. The Z-Bar Mini packs all of the style and features of its big brothers. This smaller version definitely delivers the same classic design, long reach and flexibility and multi-directional LED head. The only difference is, this Mini fits in a smaller space. Minimalism at its best. No bulky bulbs - just a slim row of tiny LEDs you can turn to illuminate any direction. Mini is a compact Z-Bar model that contains all of the great functionality of the classic Z-Bar. Features the award-winning three-bar design. The super-adjustable LED head can spin in its socket, sweep side to side, and rotate around the end of the arm to point in any direction. The Z-Bar Mini desk lamp in orange finish, by Koncept. The Z-Bar Mini packs all of the style and features of its big brothers. This smaller version definitely delivers the same classic design, long reach and flexibility and multi-directional LED head. The only difference is, this Mini fits in a smaller space. Minimalism at its best. No bulky bulbs - just a slim row of tiny LEDs you can turn to illuminate any direction. Mini is a compact Z-Bar model that contains all of the great functionality of the classic Z-Bar. Features the award-winning three-bar design. The super-adjustable LED head can spin in its socket, sweep side to side, and rotate around the end of the arm to point in any direction. 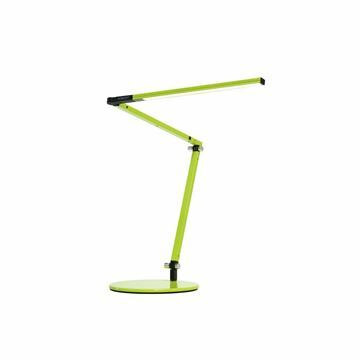 The Z-Bar Mini desk lamp in green finish, by Koncept. The Z-Bar Mini packs all of the style and features of its big brothers. This smaller version definitely delivers the same classic design, long reach and flexibility and multi-directional LED head. The only difference is, this Mini fits in a smaller space. Minimalism at its best. No bulky bulbs - just a slim row of tiny LEDs you can turn to illuminate any direction. Mini is a compact Z-Bar model that contains all of the great functionality of the classic Z-Bar. Features the award-winning three-bar design. The super-adjustable LED head can spin in its socket, sweep side to side, and rotate around the end of the arm to point in any direction. 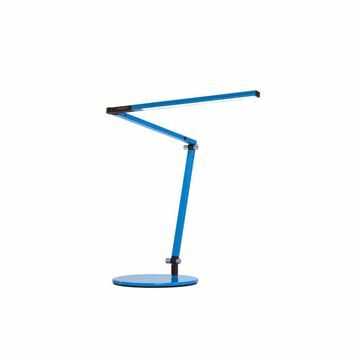 The Z-Bar Mini desk lamp in blue finish, by Koncept. The Z-Bar Mini packs all of the style and features of its big brothers. This smaller version definitely delivers the same classic design, long reach and flexibility and multi-directional LED head. The only difference is, this Mini fits in a smaller space. Minimalism at its best. No bulky bulbs - just a slim row of tiny LEDs you can turn to illuminate any direction. Mini is a compact Z-Bar model that contains all of the great functionality of the classic Z-Bar. Features the award-winning three-bar design. The super-adjustable LED head can spin in its socket, sweep side to side, and rotate around the end of the arm to point in any direction. The Z-Bar Mini packs all of the style and features of its big brothers. This smaller version definitely delivers the same classic design, long reach and flexibility and multi-directional LED head. The only difference is, this Mini fits in a smaller space. Minimalism at its best. No bulky bulbs - just a slim row of tiny LEDs you can turn to illuminate any direction. Mini is a compact Z-Bar model that contains all of the great functionality of the classic Z-Bar. Features the award-winning three-bar design. The super-adjustable LED head can spin in its socket, sweep side to side, and rotate around the end of the arm to point in any direction. Minimalism at its best. No bulky bulbs - just a slim row of tiny LEDs you can turn to illuminate any direction. The Z-Bar® Slim Desk Lamp by Koncept Lighting in Metallic Silver finish. When the classic Z-Bar is too big and the Z-Bar Mini is too small, Z-Bar Slim will be just right for your space. Modeled in the classic Z-Bar style, the slightly smaller. Slim is a midsize Z-Bar model that contains all of the great functionality of the classic Z-Bar. Features the award-winning three-bar design for ultimate reach and flexibility. The super-adjustable LED head can spin in its socket, sweep side to side, and rotate around the end of the arm to point in any direction. Minimalism at its best. No bulky bulbs - just a slim row of tiny LEDs you can turn to illuminate any direction. The Z-Bar® Slim Desk Lamp by Koncept Lighting. When the classic Z-Bar is too big and the Z-Bar Mini is too small, Z-Bar Slim will be just right for your space. Modeled in the classic Z-Bar style, the slightly smaller. Slim is a midsize Z-Bar model that contains all of the great functionality of the classic Z-Bar. Features the award-winning three-bar design for ultimate reach and flexibility. The super-adjustable LED head can spin in its socket, sweep side to side, and rotate around the end of the arm to point in any direction.